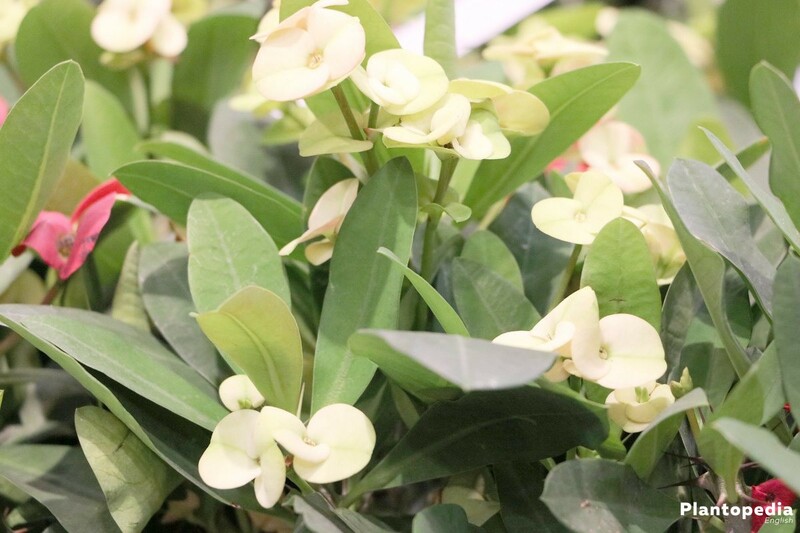 The thorny Christ plant (Euphorbia milii) is a very popular indoor plant. This is due to its frugality on the one hand and its pretty little pseudo-blossoms on the other hand, which are no real flowers in the proper meaning of the word, but spathaceous bracts located on the shoot tips. They tirelessly appear almost all the year. In the case of indoor cultivation, it can grow to lush small bushes. 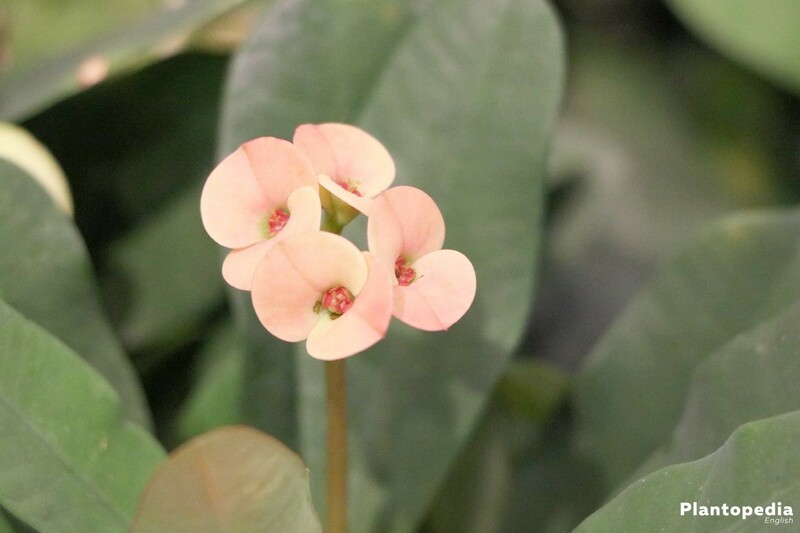 The Christ plant which originates from Madagascar, belongs to the euphorbias. 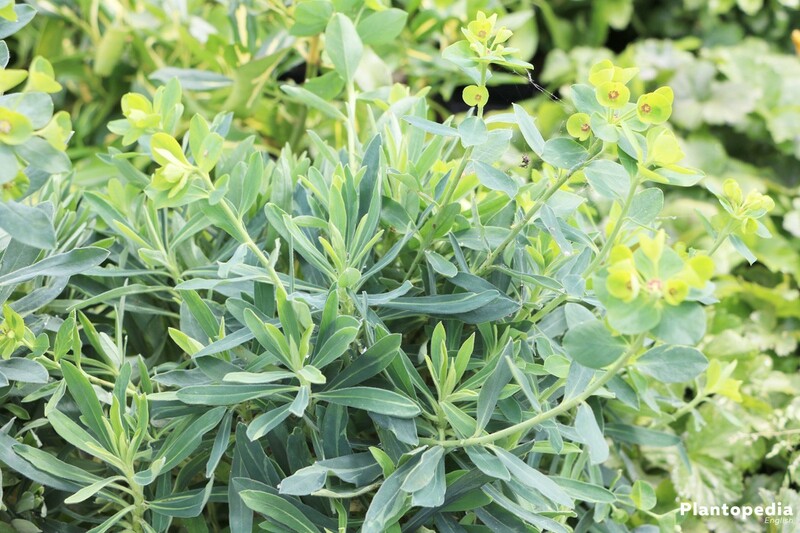 It grows as a succulent, leafy and thorny shrub, reaching a height between 10 – 50 cm, depending on the age. 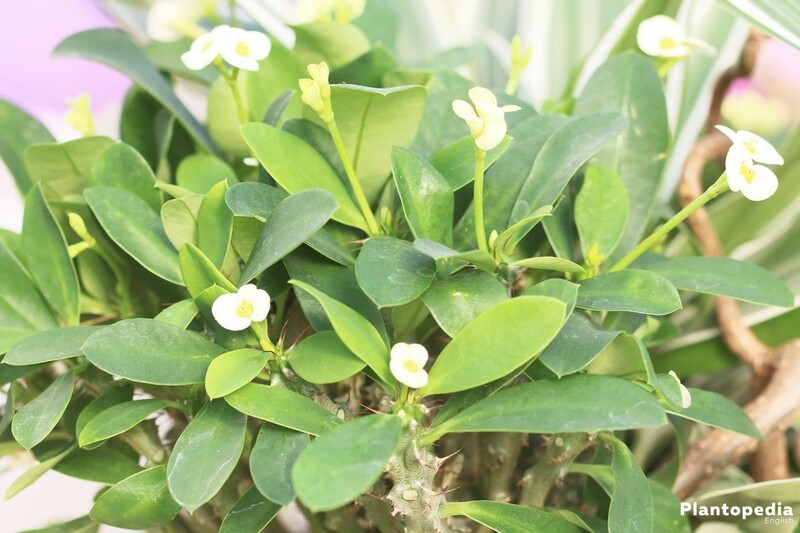 The name Christ plant is due to the resemblance between its branches and Christ’s crown of thorns. 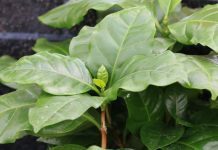 Its shoots, all surrounded by spiky thorns are brownish and covered with small, oval leaves. The bright red, pink, white or yellow flowers grow on the shoot tips. Aside from the pure forms, there are many hybrids available. 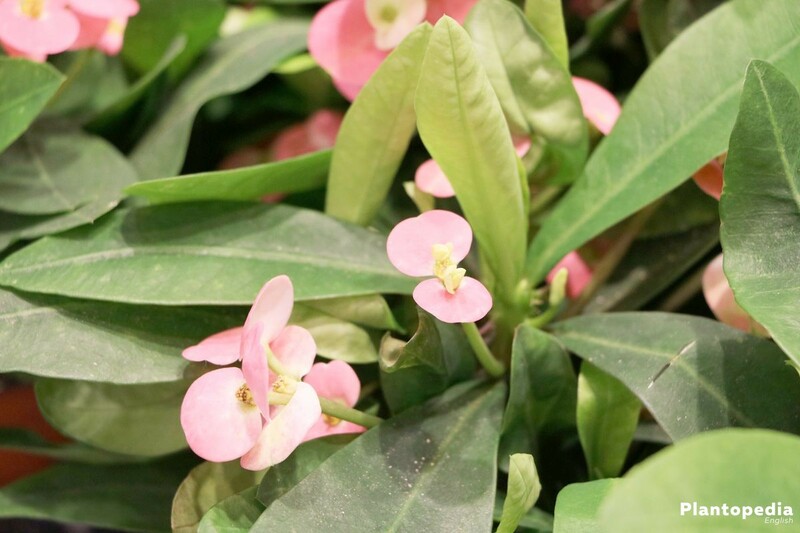 Like all euphorbias, the Christ plant is poisonous. It contains poisonous latex which can cause irritation of the human skin and mucous membranes. 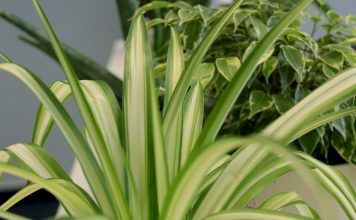 Particularly endangered are toddlers and pets such as dogs, cats, bunnies, hamsters and guinea pigs which should not come into contact with this plant. Euphorbia milii is a very unpretentious and easy-care plant which will forgive one or two mistakes in cultivation. That makes it a perfect plant for beginners. Many lovers prefer the hybrids rather than the pure-bred species. In the case hybrids, the cultivators mainly focus on a great bloom density and a flowering period as long as possible. 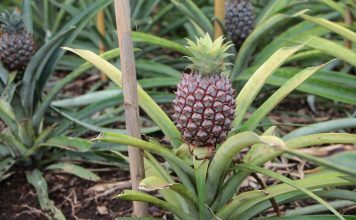 Regarding plant care, pure and hybrid varieties differ only very little. The Christ plant is a true sun-worshipper. The more intense and constant the sun exposure, the more intense the flowering and the longer the flowering period. Even the bright midday sun can not harm this decorative plant. In semi-shaded locations, the growth of blossoms is significantly reduced. Warm rooms with normal room temperature and low humidity are perfect. The air should be dry rather than too humid and the temperatures should not drop below 15 degrees Celsius. Otherwise, the Christ plant would throw off its leaves. A spot on a south-facing window is particularly suitable, even though hybrids are more independent of daylight. 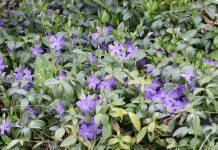 From June to September, it can also remain in a rain-sheltered place outside. 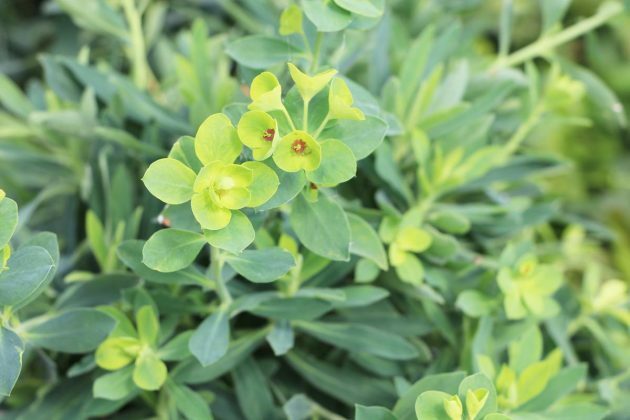 Euphorbia milii prefers a permeable, humous and sandy substrate. This can either be a mixture of soil and sand or a substrate mixture composed of 1 part of humous soil or peat substrate, 1 part of loamy soil, 1.5 parts of quartz sand and 1.5 parts of lava granules, gravel or expanded clay. The ideal pH of the soil should be between 6 and 6.8. To protect the plant against germs, it is advisable to sterilize the country soil. Commercial soil is unsuitable, since it does not meet the requirements of the Christ plant. 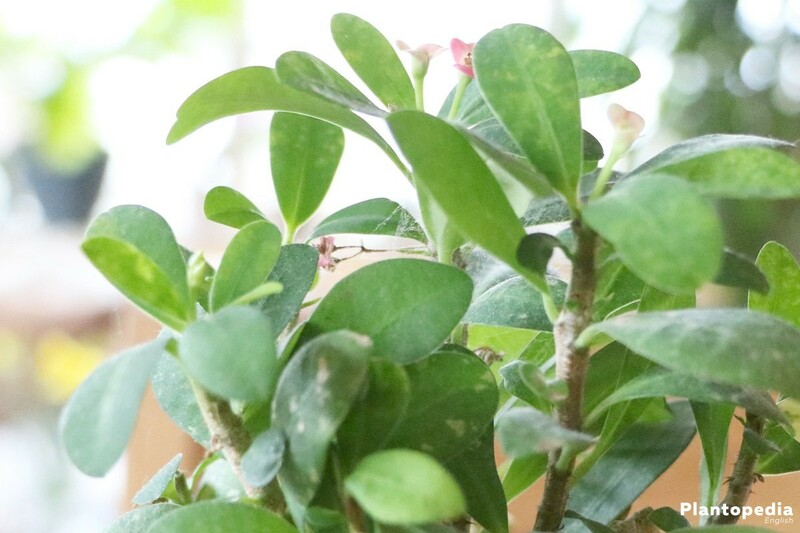 This plant should be repotted for the first time immediately after purchase. 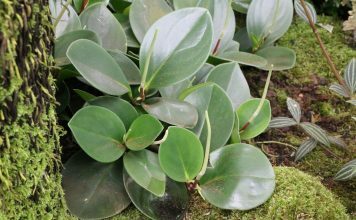 Commercially available plants are usually delivered in conventional peat or flowering soil, which is rather disadvantageous for the Christ plant. 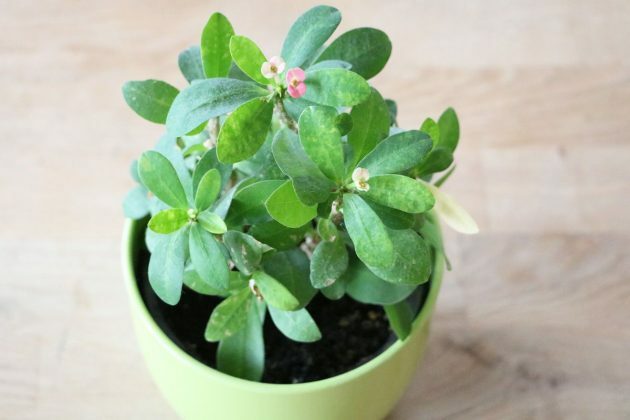 Therefore, it should be repotted in a suitable substrate as soon as possible. 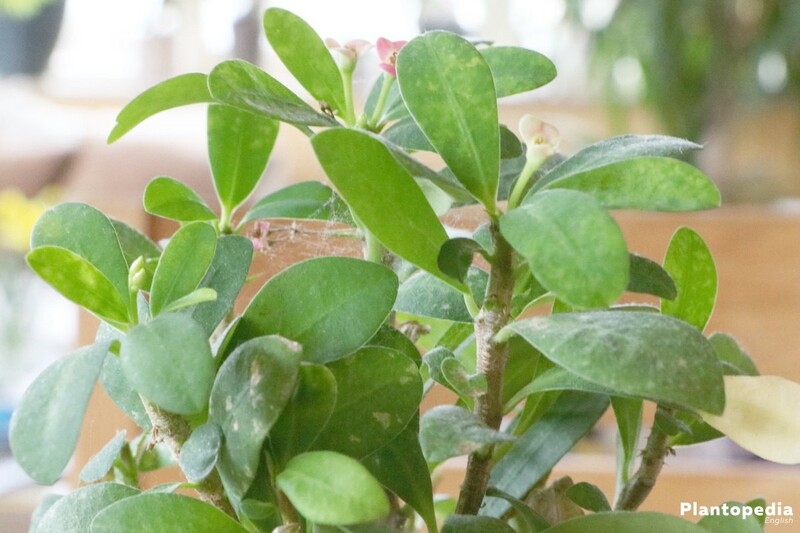 After this, young plants should be repotted annually due to their fast growth. For older specimens, repotting is recommended only every 3-4 years or as soon as the old pot has become too small and is no longer stable. 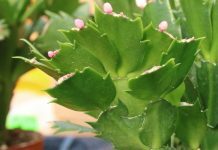 To protect yourself from the pointy thorns when repotting, the plant can be taken out and repotted for example using leather gloves, Styrofoam or cacti tongs. The Christ plant is very suitable for both soil-bound and hydroculture, but converting it from soil to hydroponics is not recommended. It would be better, to raise this plant in hydroculture from the very beginning, meaning as a scion. 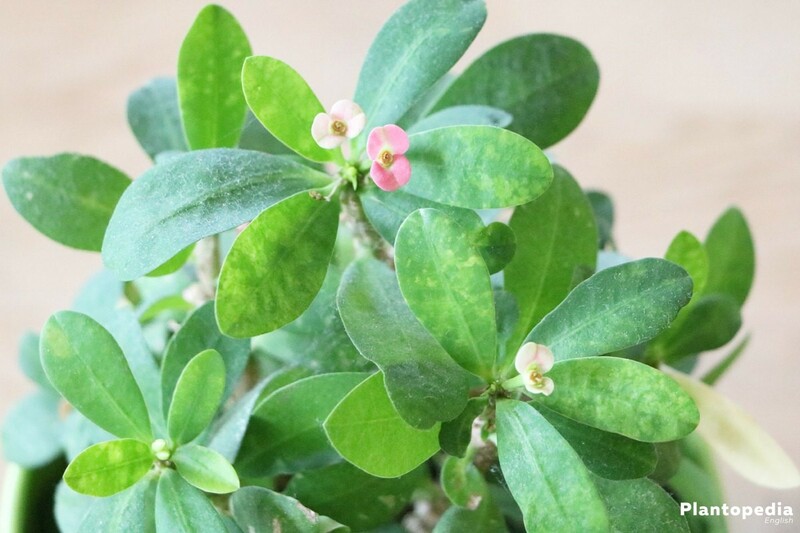 Since the water demand of Euphorbia milii is rather low, it is advisable to use a water level indicator which should remain showing the minimum for this plant. A water level indicator displays, when the plant needs to be poured. Depending on the season, this will be the case about every 3-7 days. As with the soil-bound plants, room-temperature and lime-poor water should be used for pouring. If there is no rain water available, you can also use stale tap water. It should be left to stand for at least one day. The Christ plant’s water demand is low to medium. Thus, occasional pouring is perfectly enough. Pouring is to be done in a way that the root ball gets completely moistened. Let the top substrate layer dry before pouring again. If temperatures drop below 16 degrees Celsius, let the ball dry out to about half until watering again. Despite this, however, the root ball should never completely dry out. 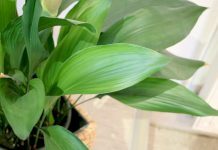 Otherwise, the plant would quickly lose its leaves. On the other hand, excess water must always be removed from the saucer. In the case of hydroponics, the water level indicator will tell you, when to pour again. In the year that the Christ plant (Euphorbia milii) is repotted, fertilizing is completely unnecessary. From the next year on, you can administer a liquid cactus fertilizer via the pouring water from April to September every 14 days. When fertilizing, it is important to never fertilize the dry substrate, because this would burn the roots. Over-fertilization should be avoided as well; it would lead to the formation of long, thin and weak shoots. In the case of hydroponics, the administration of a suitable long-term fertilizer every three months appears to be useful. 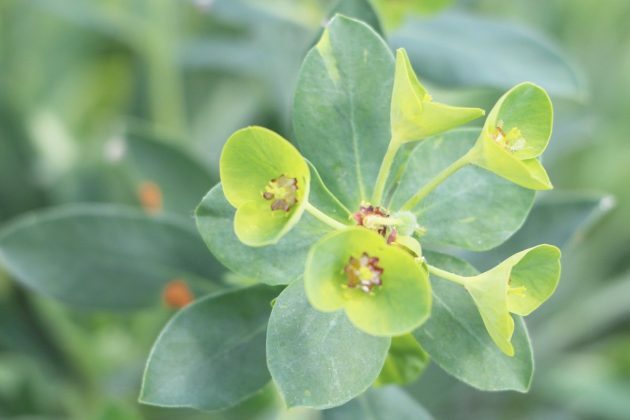 As the age grows, Euphorbia milii can reach considerable proportions or turn bald in the lower part, which may justify a cut back now and then. 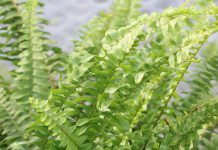 The plant tolerates trimming well and can basically be cut all year round. 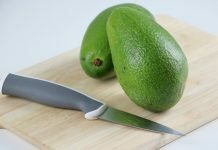 Because of the poison of the Christ plants, you should always wear gloves and, if possible, protective goggles during cutting operations, to prevent the highly irritating latex from touching your skin or mucous membranes and causing irritation there. 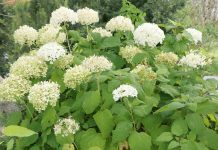 Furthermore, it is useful to cut the plant outside or at least in a well-ventilated room. 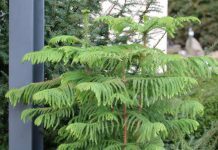 During the cold season from October to February, the Christ plant should be treated to a 4-6-week rest period at somewhat cooler temperatures around 15 degrees Celsius. You can do this by drying it up, so to speak. That means, that the amount of water is gradually reduced until you finally only pour to keep the root ball from completely drying out. Temperatures around 15 degrees Celsius in winter are conducive to the formation of new flowers. If, on the other hand, you keep pouring as usual, the plants tend to etiolate. 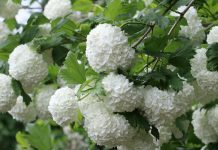 They would grow long, thin and weak shoots which do not produce flowers. While dry heating air is a big problem for most plants especially in winter, the Euphorbia milii almost desires it, even all year round. For hydroponics, the water level should also be lower then. Fertilizing is not to be done in winter, neither for soil-bound nor for hydrocultures. 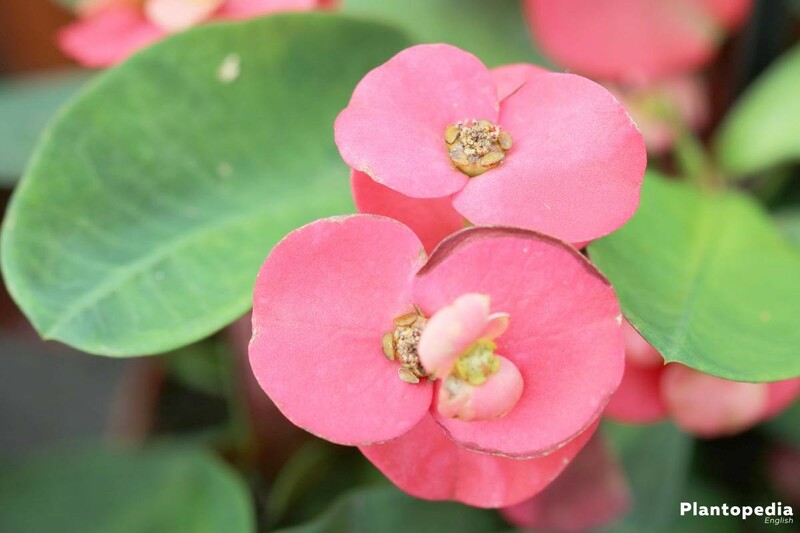 A propagation of the Euphorbia milii, Christ plant by sowing is more elaborate than using cuttings, but still possible. For this purpose, the seeds are spread on the cultivation substrate, only slightly covered with soil and then moistened. Subsequently, the propagator is covered with a transparent plastic film or a plastic hood depending on the vessel, to create optimal germination conditions. The whole is then put in a warm and bright place, but protected from direct sun exposure. To avoid mold and putrefaction, the cover should be removed daily for a short time to vent the substrate. After about 3-4 weeks, the first seedlings appear in most cases. When they are about 10 cm in size, they can be separated and put in small pots for further cultivation. 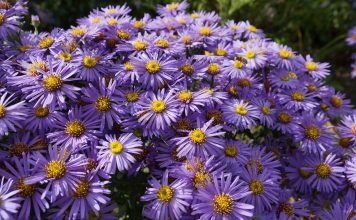 The best time for cultivating scions is in spring, ideally after cutting back the plant. Thereunto, 8-10 long shoot tips are cut off and the leaves are removed, apart from the upper ones. After cutting, you will notice white latex running out of the cuts. This so called “bleeding” can be stopped by placing the scions in lukewarm water until latex stops leaking out. 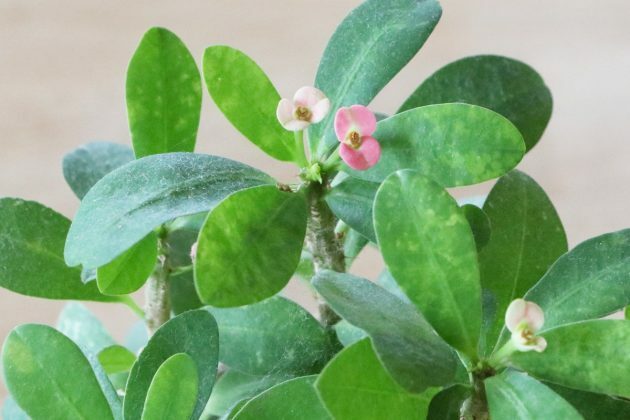 Since the Christ plant (Euphorbia milii) tends to quickly appear unsightly if you cut off too many scions, there is a possibility to receive several new plants from one cutting. 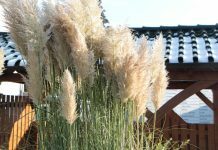 Particularly older plants, which have dormant buds almost full-length on their shoots which can thrive again, are suitable for this purpose. These scions are not inserted into the substrate as usual, but they are planted horizontally. 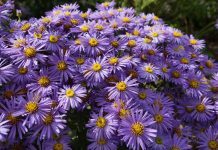 This way, they will thrive from several buds and quite a few rooted scions or rather young plants are produced. 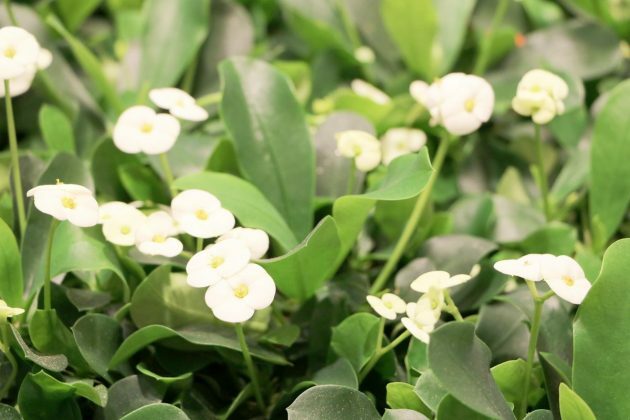 If you want to keep Euphorbia milii in hydroponics, it makes sense to already grow the cuttings in hydroponics from the very beginning. To do this, the lower leaves are removed from the cutting and rooting is done in willow water. Willow water can easily be self-made by removing the leaves from this year’s shoots of a willow and dividing them into about 2 cm small pieces, that are drawn into water for 24 hours. Then the water is poured off and the cuttings are set in. Alternatively, rooting can also take place in a vessel filled with granules, whereby the used vessel should, of course, not have drainage holes. 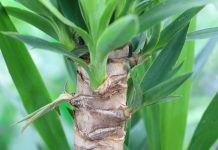 As soon as enough roots have grown, you can repot them in commercially available hydrotubes. It is essential to use a water level indicator and always keep it at the minimum. 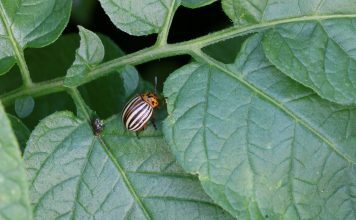 Thanks to its high content in poison, most pests usually stay well clear of the Christ plant. It is also relatively robust towards diseases. Nevertheless, too much water can cause root rot. Affected plants often can not be rescued. As a precaution, attention should be paid to drier cultivation.